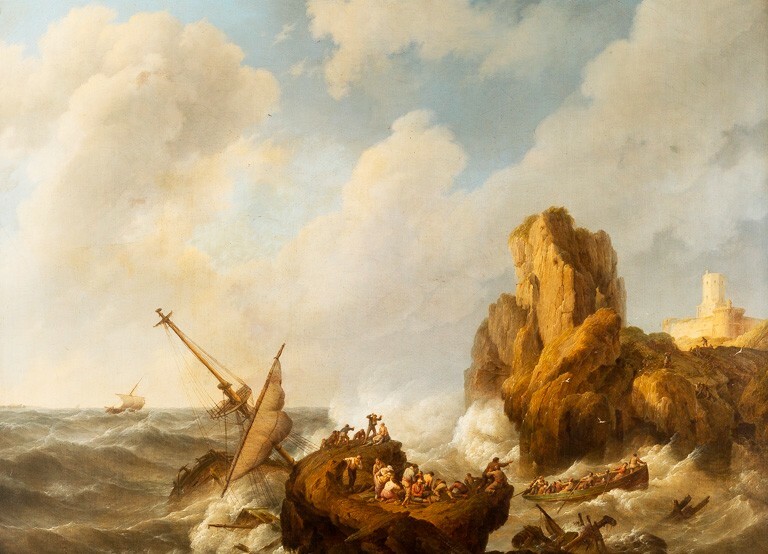 On the historic premises of Künstlerverein Malkasten, the painting Storm at Sea, by Johannes Hermanus Koekkoek (1778-1851) — a leading master of Dutch maritime scenes — was returned to representatives of the Max and Iris Stern Foundation and its three university beneficiaries — Concordia University and McGill University in Montreal and Hebrew University, Jerusalem. It is the 18th painting recovered on behalf of the Foundation. Koekkoek was the head of an extraordinary dynasty of Dutch artists and one of the most accomplished Romantic seascape painters of his time. Thanks to a tip from within the European art trade, the Max Stern Art Restitution Project (MSARP) team first advised the Stern Cooperation Project in Munich (SCP) and then turned to Hargesheimer Kunstauktionen Düsseldorf where the painting had been slated for sale. Following exchanges about its tainted history between the Holocaust Claims Processing Office, Frank Hargesheimer and the painting’s consignor, it was returned to the Foundation without challenge. “Art restitution is an integral part of Holocaust Remembrance, respect for human rights and international justice. I would like to congratulate the Stern Foundation and the Düsseldorf auction house on their agreement and exemplary commitment to redressing past injustices”, said the Honourable Stéphane Dion, Canada’s Ambassador to Germany and Special Envoy to the European Union and Europe. This year thanks to major funding from the German government, the Stern Cooperation Project was established. Based at Munich’s Zentralinstitut für Kunstgeschichte, a team of researchers from Germany, Canada and Israel are studying the fate of the Stern family as an example of forced migrations and provenance matters in relation to Nazi-looted art. This scholarly work coincides with a period of divergent restitution practices within the German art world. Lempertz has repeatedly denied any historical wrong-doing nor has the company changed its position on Stern claims. As a case in point, during this fall’s Lempertz sales, the MSARP team flagged the work, Cairo, by Emile Charles Wauters (1846-1933), which was also sold by force like the Koekkoek in the 1937 sale. Auction house officials did not respond to formal queries about its problematic past and instead tried to sell it. Even more disconcerting was how German law enforcement was unwilling to investigate the matter despite the work being listed as stolen on the Interpol database. Arriving at fair and just solutions in Germany is far from consistent. It in this light that the November 26-28 federally-funded conference in Berlin — “20 Years Washington Principles: Roadmap for the Future” — will hopefully address and act on the problematic restitution record of many German organizations.